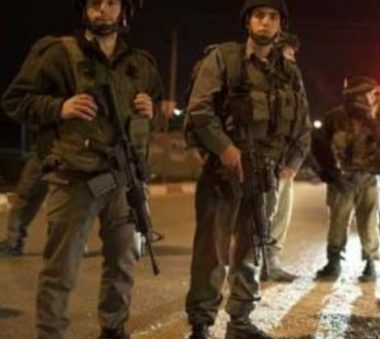 Israeli soldiers abducted, on Monday at dawn, four Palestinians, including two children and a former political prisoner, from their homes in Nahhalin town, west of Bethlehem, in the occupied West Bank. Sobhi Zeidan, the mayor of Nahhalin, said the soldiers conducted extensive and violent searches of homes in the town, before abducting the four Palestinians. He said that the soldiers abducted former political prisoner, Karim Mohammad Shakarna, 21, in addition to Mahmoud Ezzat Shakarna 18, Khalaf Fadi Najajra, 14, and Mahmoud Ahmad Najajra, 14. The soldiers also invaded the home of Mohamad Ezzat Shakarna for the second time in 24 hours, after the army invaded it, at dawn Sunday, and shot his son, Noureddin, 20.